Ladies, Look Your Best With Clothes Designed By The Best Tailors In Town! Whether you want to alter your old blouse or stitch a new one, these ladies tailors in Chennai are the best for all your stitching needs. Hit these tailors up to stitch anything from skirts and shirts to lehengas and cocktail gowns. 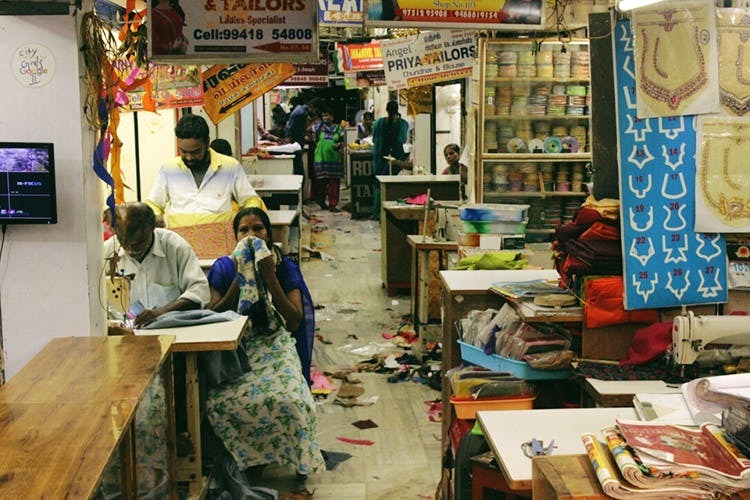 Family Tailor is a 70-year-old iconic tailoring shop in Mylapore. They are known exclusively for their blouse tailoring and they’ve got a great collection of fabrics as well as designs for blouses. You can get a blouse stitched starting INR 500. If you’re looking for the best ladies tailor in Chennai, Selvam is definitely one of them. He sits with his sewing machine in Abhiramapuram and will snip and cut everything you need within minutes. Call before you go as he changes his location sometimes, and take a piece of clothing that fits you. Most college students from MOP, WCC, and Stella, come to Jeebi Tailors for their wardrobe changes and stitching needs. This exclusive ladies tailor is the best if you’re looking to get some stylish clothing stitched. Cold-shoulders, off-shoulder tops, high-necks, and heavily embroidered outfits, they stitch ‘em all. Lehenga blouses, skirts, and dresses, the best ladies tailors are right here at this store. Give them any piece of clothing and they will transform it starting INR 600. Head to Golden Plaza in Ranganathan Street, T Nagar as they’re known for the best ladies tailors who can stitch what you need within an hour. For last minute blouse stitches and alterations, these 1-hour tailors are awesome. Somu Ladies Tailor in Fountain Plaza is a great option for those ladies looking to get cocktail gowns and modern dresses stitched. Lehengas, wedding outfits, gowns, Somu Ladies Tailor will stitch them up real good. Did we miss something? Tell us in the comments!